This is the winter of all winters in the Telluride area. 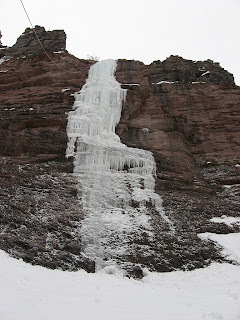 With new ice climbs popping up all over, my self and Dan Goss hiked up about 1000 feet above the valley floor (one mile east of Telluride) to discover that the ice climb we had been scoping out for a week or so was not a short little melt climb, but rather a 140’ Grade 4-. We called it Secret Steps. 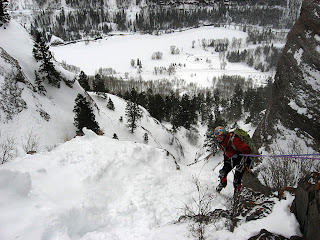 The approach hike may turn some climbers away as it took us nearly two hours hiking in waist deep snow. Access to the cliff does cross private land but so long as you do not park on Royer Lane and rather walk, you should be fine. I drilled an two bolt anchor at the top of the climb. Rap: 25M. Photos by Dan Goss: Damon Johnston on FA of Secret Steps, WI4-R, Jan 18th, 2008. You don't get any real protection until your about 60' up the route. 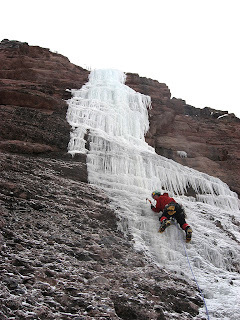 There are many other new ice routes as well—more on these other routes in the near-future.